CHAPTER 8: IN WHICH WE GET A DO OVER...DARN IT! Balkans & Beyond, Days 14 & 15: Budapest, Hungary to Cluj-Napoca, Romania. With an 8:25 am flight out of Budapest, we were thankful our travel day was on a Sunday. 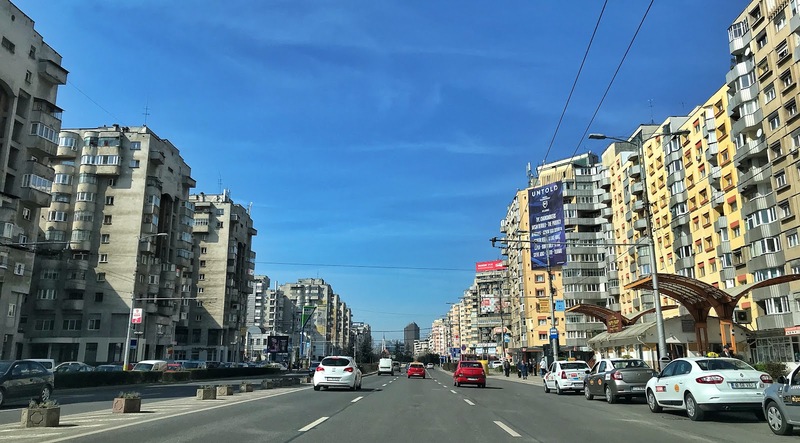 Even with no traffic, it was a 30-minute taxi ride to reach the airport, 15 miles outside the city center via surface streets. We had just enough time to grab a bite of breakfast and get through passport control before reporting to the gate for our flight. 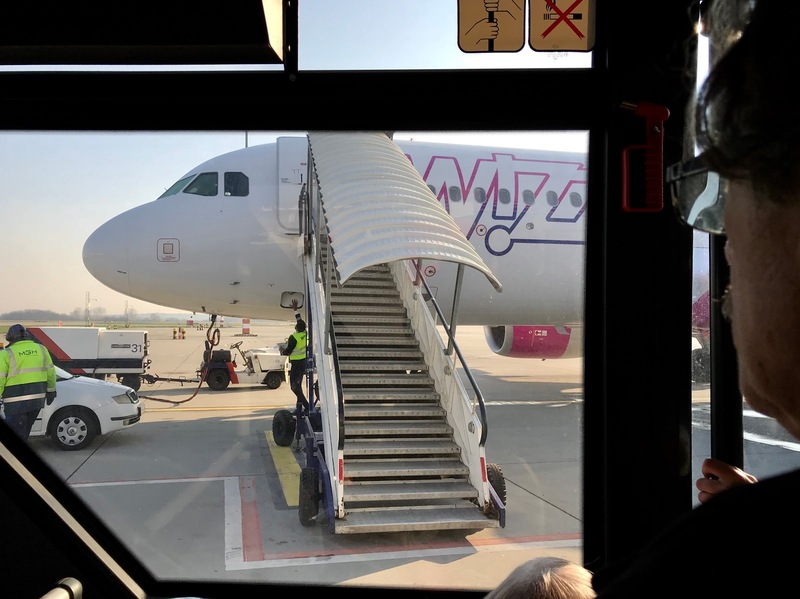 Like other discount airlines, Wizz Air, Hungary's low cost carrier, operated from a small ground level gate with no seating area. Passengers were loaded onto an airport bus and ferried to the aircraft at a remote stand, well away from the terminal—in the cheap parking zone. We want out of this bus! This procedure was fine and not at all unexpected. What made it completely miserable was that: a) the bus was significantly too small for the number of passengers, so we were crammed in like sardines; and b) the bus heater was blasting unmercifully, pushing the inside temperature up past 80°. We endured these conditions for half an hour at the gate during the excruciatingly slow boarding process and then again after we reached the plane, which was still undergoing its preflight inspection. At least the bus doors were open at the gate, offering a modicum of relief. But parked near the airplane, there was no escaping the stifling heat because the driver couldn't open the doors. Just as passengers were about to riot, we were finally released to climb the airstairs to the plane. In her preflight announcements, one of the flight attendants had the grace to apologize for the boarding delay. We barely had time to sit back and finally relax before the pilot announced we were making our approach to Cluj-Napoa, Romania. That's when we realized we had crossed into another time zone, and what we thought was a two-hour flight took only half as long. In another delightful surprise, two buses met the plane at its remote location away from the Cluj terminal, so the transfer was much more pleasant. The Cluj bus was more spacious and properly ventilated. Our arrival in Romania marked a new aspect to this trip. Most of the countries of Western Europe are part of the Schengen Zone, an area comprising 26 countries that have abolished passport control and customs checks at their mutual borders. Traveling from one country to another in the zone is seamless, akin to crossing borders between U.S. states. You go through passport control and customs only when you enter the zone and when you leave it. Beginning with Romania, we are out of the Schengen area and will undergo border controls every time we travel to another country for the next six weeks. We don't expect any difficulties, but we'll certainly spend more time standing in lines. At the Cluj airport, we stopped at the Hertz desk to pick up our rental car and were hit with a blast of deja vu when the helpful agent shared what he thought might be vital information about the local calendar. 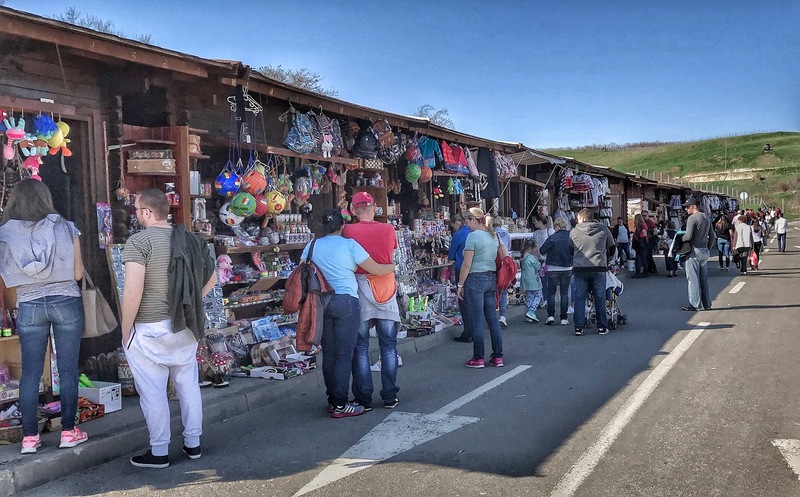 Like the previous week in Bratislava, we had arrived on Easter Sunday (85% of Romanians are members of the Christian Orthodox faith and follow that calendar), so most businesses were closed including stores, restaurants, and museums. Moreover, as in Slovakia, Easter Monday is also a national holiday in Romania and, yes, the closings extended into Monday as well. Arriving at the Doubletree Hotel, we were grateful to learn that the staff had kindly upgraded our room to a bright and spacious suite with a separate living room. 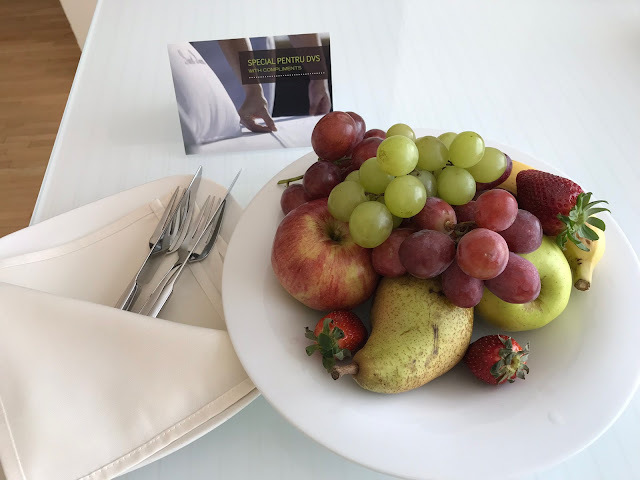 As we were settling in, a complimentary bowl of luscious fruit was delivered to the room. Having denied ourselves most fresh produce for the last week, how tempting it was to dig into what our eyes told us was healthy food. Before grabbing a handful of grapes, we consulted our CDC Can I Eat This? app. It was not nearly as enthusiastic about this lovely bowl of fruit as we were. 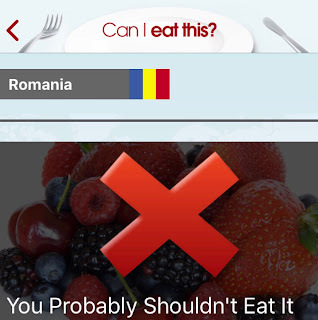 Since by then, we had both had some mild repercussions from our lax attitude about salad precautions in Budapest, we steeled ourselves to resist the temptation. What to do then with this generous gift? We certainly didn't want to leave it in the room untouched or throw it in the trash when it was perfectly good food for anyone local. So we packed it in a bag, took it with us on our walk later and gave it to a gentleman we met who told us he was a poor man and tried to sell us some trinkets. He seemed extremely pleased with the gift. With most everything closed, we spent much of our two days in Cluj walking around the Old Town area. We did check out the Gothic St. Michael's Church in Union Square. As a Roman Catholic church, it was open to visitors on Sunday, having celebrated Easter the week before. Ground was broken for St. Michael's in 1316 but construction was not completed until the 1440s. 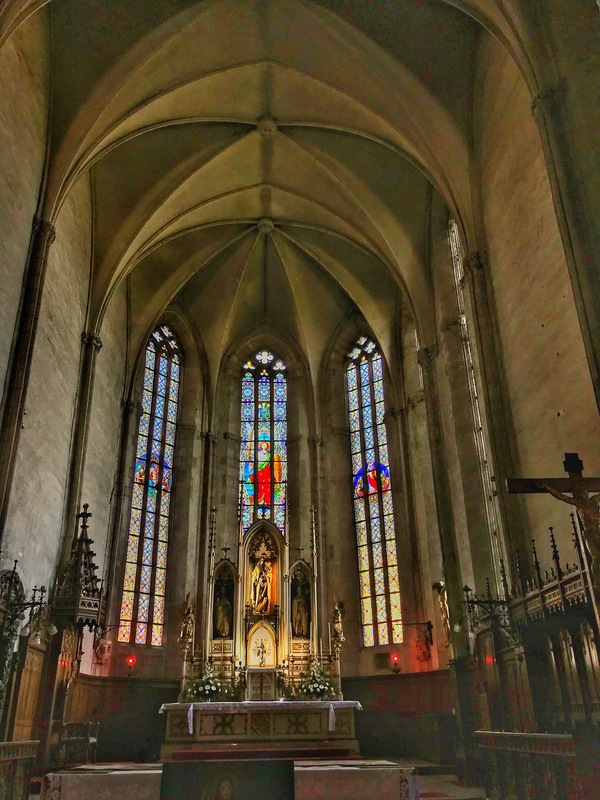 During the Protestant Reformation, the church was converted to Protestantism in the mid 1500s. In 1716, it was confiscated by the Hapsburg government and returned to the Catholic Church. 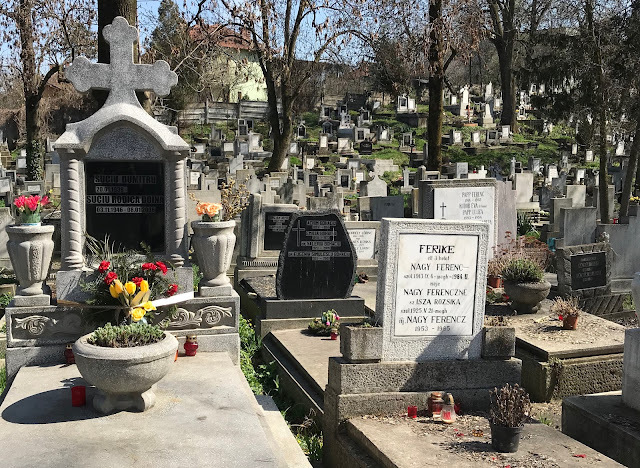 Another place that was open despite the holidays was the city's Central Cemetery. Founded in the late 1500s, the burial ground covers 54 acres and is home to some 33,000 tightly packed graves. There are no distinguishable rows between graves except a few cobblestone lanes. On a positive note, there is very little wasted space between graves in the cemetery. 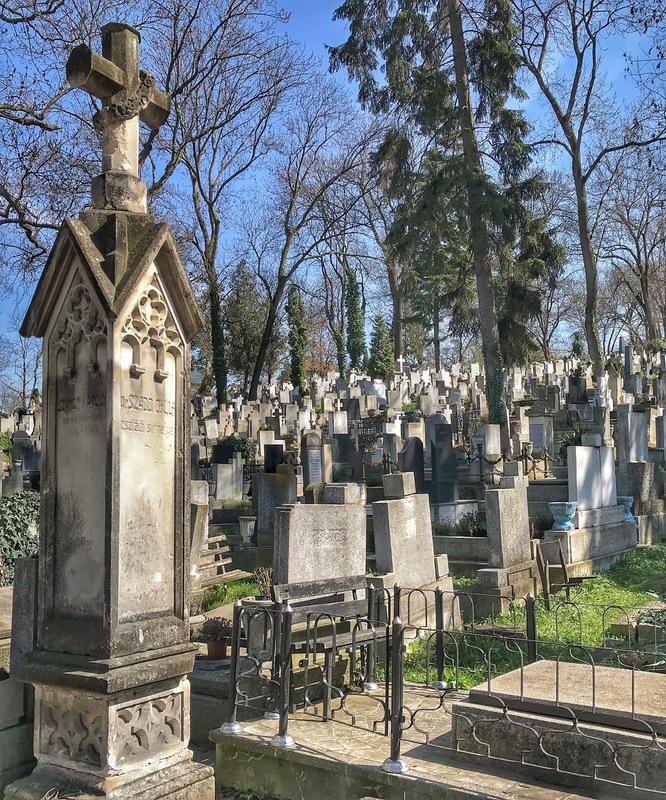 Based on the names listed on headstones, most plots are home to multiple people. As in Hungary, names are written with the family name first, then the given name. 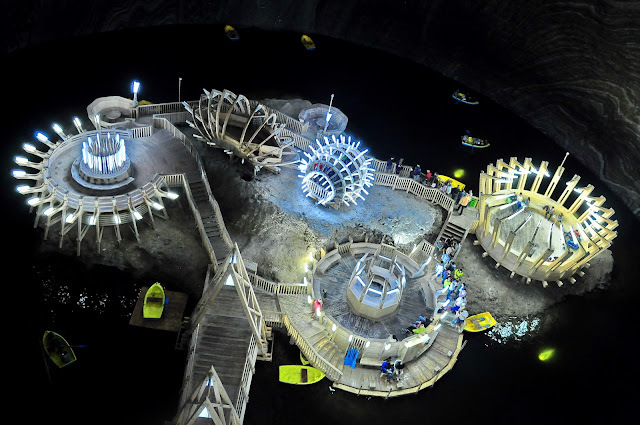 Almost every single person we've met in Cluj insisted that we must visit Salina Turda before we left the city. 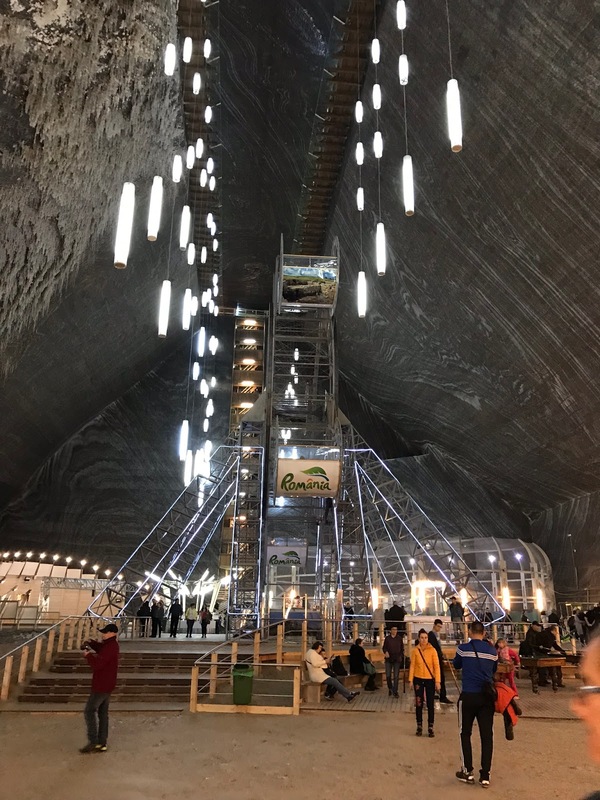 Located about 16 miles from the city of Cluj, Salina Turda is a salt mine located in the town of Turda (TOOR-deh) and visited by thousands of Romanians and tourists each year. 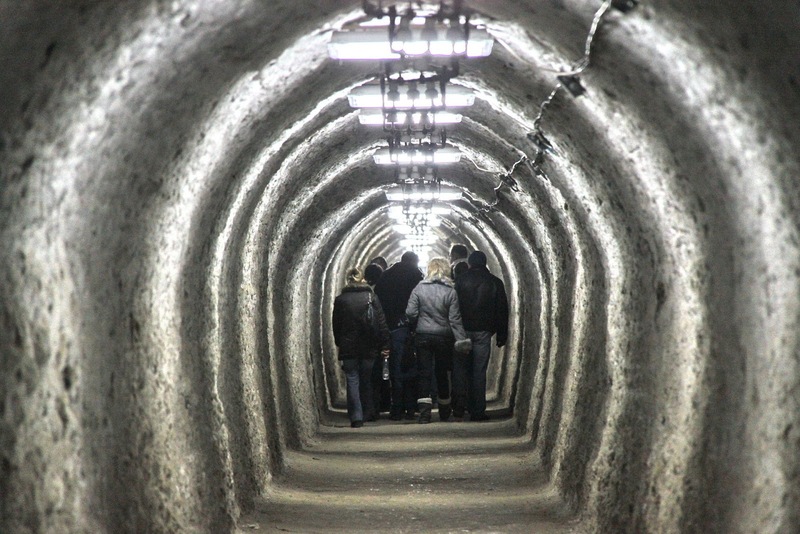 Salt was first extricated from the mine in the days of the Roman Empire, and table salt was continuously mined there from the late 1200s until 1932. After the mine closed, it sat empty for sixty years until it was opened as a tourist attraction in 1992. Additions of a small amusement park at the bottom of its 13-story dome and a clinic offering homeopathic salt therapy spa treatments have ensured its popularity. 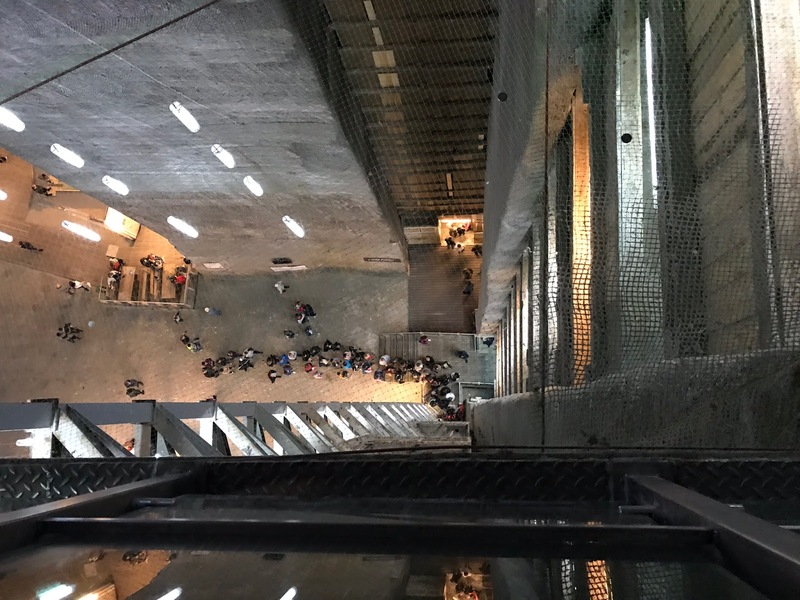 From the top of the elevator shaft, one can see the line to ride back up. After learning about the amusement park, we had decided it wasn't our kind of place, but again Monday morning, we met several people who absolutely insisted we could not miss this marvel. When we argued that it was probably closed for Easter Monday, one of the guys investigated and learned it was open. And he assured us there was a museum as well as the amusement park. With nothing else planned, we did our part and drove to Turda to see this source of local pride. Fanciful structures surrounded by the lake with yellow pedal boats. Indeed it was open, and we weren't the only ones who knew about it. As we drove up the approach road, we noticed that the overflow parking area was overflowing. We continued to the parking lot near the entrance, extracted a ticket to open the gate and found a space for our little VW Polo. After paying our admission, we walked through a long salt-encrusted tunnel and down 150 salt-encrusted stairs to reach the queue for an elevator ride down 360 feet to the floor of the mine. Based on a raw estimate, there must have been almost 2,000 visitors at the mine today. The single elevator held a maximum of seven passengers. But at least it wasn't overheated, and a weight sensor prevented overcrowding. The museum we expected to find turned out to be a small exhibit of a half dozen tools used in mining. Since we're not big amusement park fans, we declined the ferris wheel and merry go round and stayed just long enough to snap a couple of photos, make a pit stop, and get back in line to wait 30 minutes for the elevator ride back up. Returning to the parking lot, we stopped at a kiosk to stand in another line and pay our parking fee before returning to the car. According to the ticket machine, we had 15 minutes to depart or we'd have to pay extra. The only problem was, there was a line of about 20 cars waiting to exit the gate. The first three vehicles had no drivers because they had forgotten to pay before going to their car. It was a great time to be driving a small vehicle. Ken maneuvered that little sub-compact around the empties, threaded the needle, and was through the gate in a flash. "Step on it!" we both yelled as the gate opened. 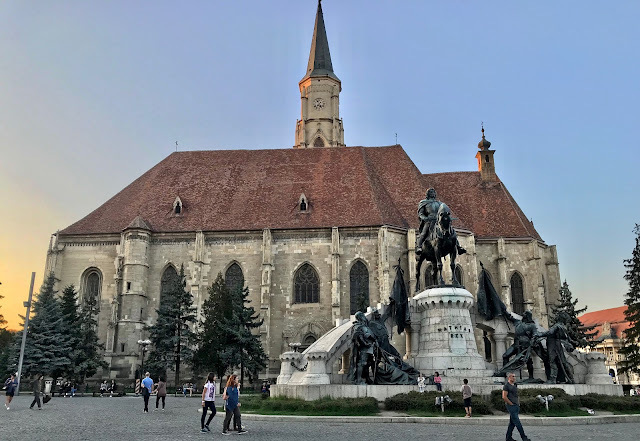 Tomorrow we'll leave Cluj and spend a day exploring Sighișoara, a well-preserved medieval town deeper in the heart of Romania's Transylvania region. Loved: Finally arriving in Romania, a country we've talked about visiting for a long time. Learned: Like many things, Easter ain't over till it's over where you are. And be careful what you believe from the locals, especially when you know you know better. 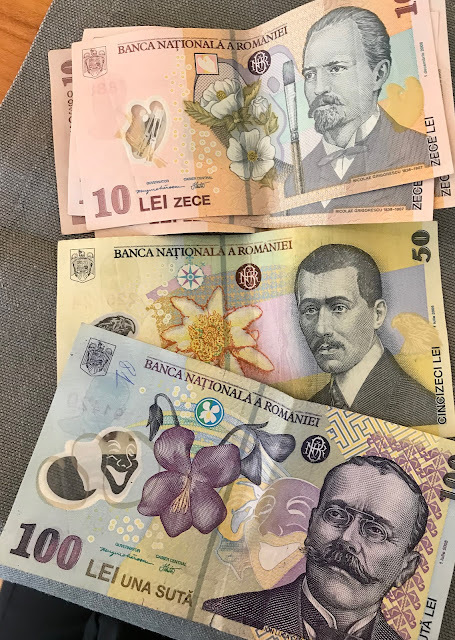 Having different color bills for different denominations is so sensible! The crowded stalls selling tourist junk should have kept us from even entering the parking lot at the salt mine.